We have set up a preview period for inspection of all of the items for auction. You can see all of the items at this time. If you bid, please make note of the dates, for preview, and pick up. If you have conflicts with the dates please notify us before bidding. 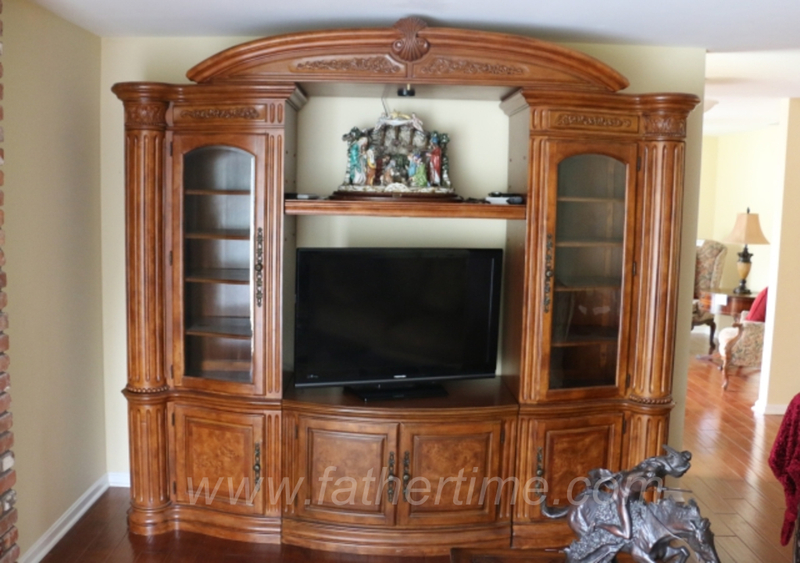 The sale is a mini moving auction of house hold items which are in very good condition and high quality. See the terms and conditions for this and all auctions. SEE ACTUAL AUCTION FOR BEST DETAILS... CLICK YELLOW BUTTON ABOVE! 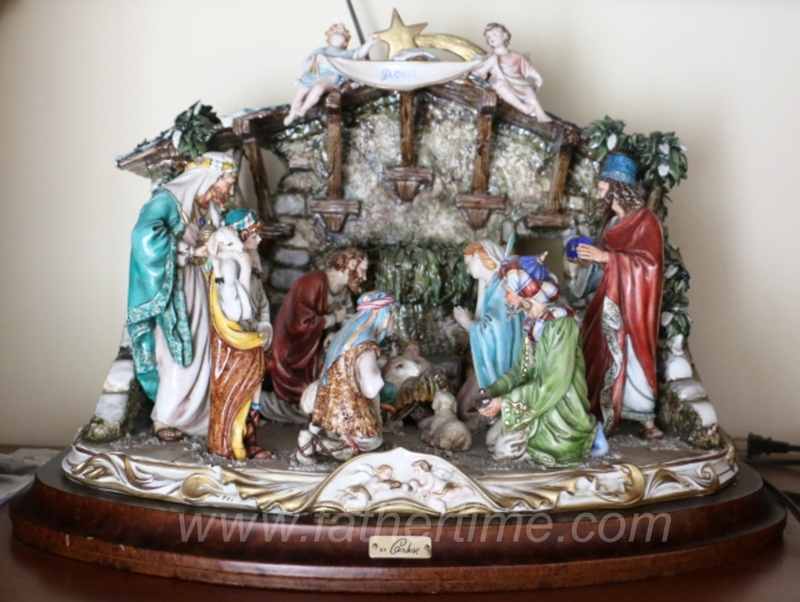 Porcelain Capodimonte Nativity Scene by Cortese mounted on a wooden base. Made in Italy. Entertainment cabinet consisting of 5 separate sections joined together or they can be used separately. Beautifully crafted with rich hard woods, burled wood doors, beveled glass door inserts and bronze antique style hardware. Cabinet has a lot of display and storage area. Toshiba 40" Flat screen TV with table top stand, July 2009 production date. Area Rug 8 ft. x 11 ft., hand tufted and hand made from virgin wool, in India for C. A.
Gertmenian and Sons for The Classic Wool Collection. Frederic Remington bronze sculpture, "Cheyenne" reissue of the original bronze under copyright agreement, mounted on a marble base with an etched brass plate. 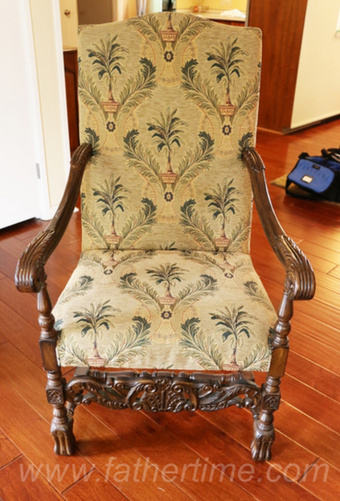 Jacobean style Arm Chair from the 19th century design, with tropical inspired brocade fabric upholstery. Small Secretary Desk with Italian style inlay, and bronze hardware. 33" W x 15" D x 34" H.
Antique Arm Chair with padded leather seat. Console table with beveled glass top covers the herring bone wicker top. 50" W x 19" D x 29" H.
Antique mahogany side chair with a floral design needlepoint seat covering. Antique style upholstered chair, button tufted back, brass tack accents and rich muted floral chenille fabric. Antique style upholstered chair, wing back, brass tack accents and rich muted floral chenille fabric and ottoman in the same fabric. Cupid like Figurine in a bronze finish on a raised pedestal base, 14" H.
Vintage Drum Table on a pedestal with four splayed legs, and tooled leather top. Antique style table lamp, silk shade, 31" H.
Asian Antique style chest, bronze hardware accents and distressed finish, 55" W x 27" D x 34" H.
French Provincial Style Buffet Cabinet, 59" W x 21" D x 35" H.
Book Case with laminate top, 36" W x 14" D x 31" H.
Antique Style Bed by Broyhill, King size bed frame and linens. Antique Style Night stands (pair) by Broyhill, light brass finished hardware, 36" W x 19" D x 31" H.
Antique Style Dresser by Broyhill, light brass finished hardware, 44" W x 20" D x 61" H.
Antique New Haven clock, mantle clock with time and chime. Antique Oak Stool with bronze claw and glass ball feet and swivel seat. Vintage heart stained glass window, red heart in a green heart on clear textured background. 21" W x 15" H.
Vintage 400 day clock by Welby with a West German movement. Antique style Covered Urns (pair) Serves in porcelain, 19" H.
Roseville vase Fuschia pattern, 8" H.
Vintage Vases, set of 3 vases, 1 Pagoda vase by Hull pottery orange glaze, 2 unmarked orange vases. Vintage Pitcher unmarked Bavarian style. Vintage figurines, ceramic duck made in Italy, girl with a squeeze box, cold painted metal. Area Rug 8 ft. x 12 ft., hand tufted and hand made from virgin wool, in India for C. A. 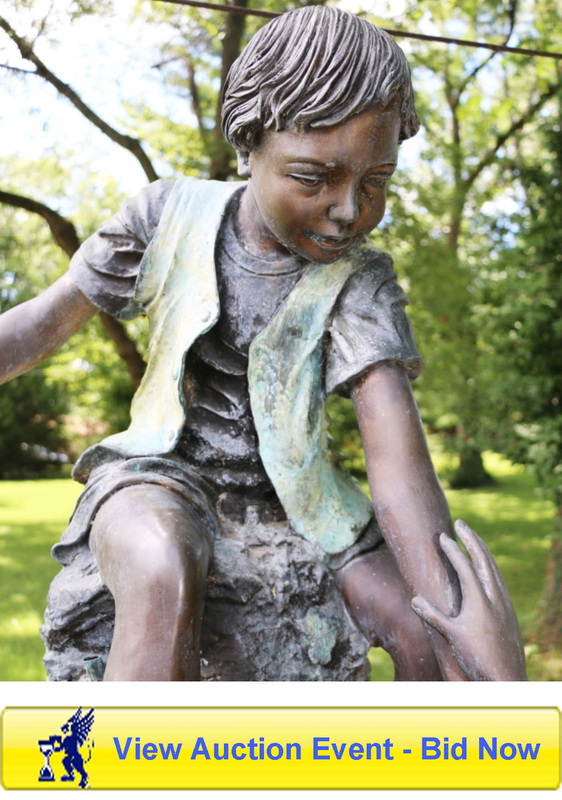 Cast Bronze Fountain head of 2 boys climbing up on rocks with one boy helping the other up. Patio table and 4 chairs, black Woodard style set. Baja Kids size- ATV- All Terrain Vehicle. Frederic Remington bronze sculpture, "Mountain Man" reissue of the original bronze under copyright agreement, mounted on a marble base with an etched brass plate. Frederic Remington bronze sculpture, "Bronco Buster" reissue of the original bronze under copyright agreement, mounted on a marble base with an etched brass plate. Harvest table 7' x 38", with leaf 10' x 38", with 2 matching custom built benches 71" long.